At love.fish we serve our fish simply and let our produce shine. Perfectly cooked fish can be difficult to replicate at home, so here are Michael’s tips for nailing it every time. 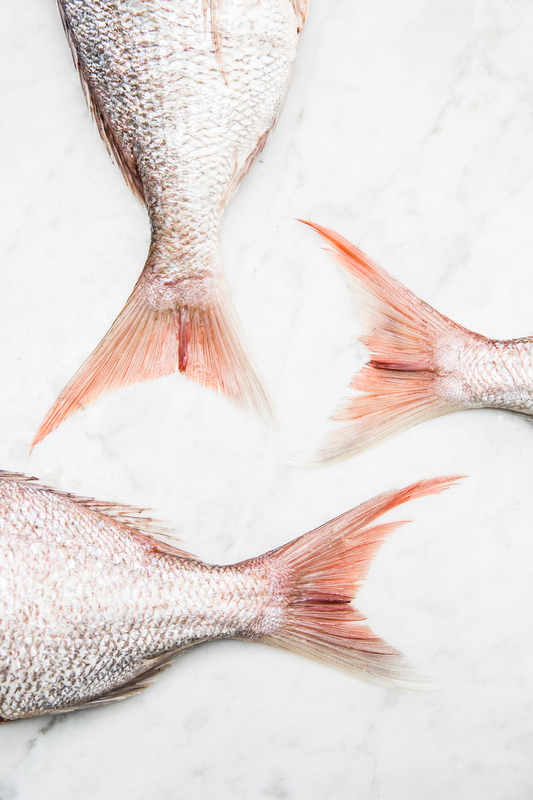 For a crispy skin and perfectly cooked flesh start with 200g fillets of Australian Barramundi, Salmon or Kingfish. Ask your fishmonger to scale the fish and leave the skin on. Take care to pat the fillet and skin dry and generously sprinkle with your favourite sea salt flakes. Let the fillet sit for 5 minutes whilst you heat a heavy based pan, preferably stainless steel or cast iron as it holds the heat evenly. Add a good dash of neutral oil like grapeseed and heat on a medium-high setting until smoking. Carefully place the fillet skin side down in the centre of the pan. The skin will want to curl when it touches the heat. We use special fish weights at love.fish that we place on top of the fish to keep the skin flat and cooking at an even rate. At home, you can use a heavy-based smaller pan or press down on the fillet with a spatula. It will only take a minute for the skin to stop resisting. Now for the difficult bit. You will be tempted to flip the fish over but patience is required! You may lift the edges of the skin occasionally to ensure it’s not burning but don’t worry about it sticking. After a few minutes, you will see browning on the edges of the skin and the flesh starting to cook about halfway up the side of the fillet. This is when the skin will release itself from the pan and you can gently turn it over with a flat spatula and continue to cook on the other side for another few minutes. Do not overcook! Remember all fish continues to keep cooking even after removing it from the heat and must be left to rest. Barramundi is best served just cooked and Salmon and Kingfish are best served underdone as they easily dry out. The goal is beautifully crispy skinned fish that is still moist and flavourful. Talk to your fishmonger. Choose Australian seafood for our quality and ethics. Use the right pan. The right amount of evenly spread heat is essential. Remove the moisture before cooking to ensure a crisp skin. Always cook skin side down first and only turn fish once during cooking. Adjust your cooking time to the thickness of the fillet. Always cook for less time than you think – fish keeps cooking as it rests. Rest before serving and serve simply with lemon. If you would like Michael to cook the fish for you, click to book below!